In November, the five partners SustainableEnergy (SE), International Network for Sustainable Energy (INFORSE), Suswatch-Kenya, Uganda Coalition for Sustainable Development (UCSD) and Tanzania Traditional Energy Development Organization (TaTEDO) met in Bonn in relation to COP23. The PIPA project seeks to increase the ambitions for low emission targets and poverty reduction in the implementation of the Paris Agreement from 2015. For effective advocacy to be achieved, the project focuses on influencing the process of adjusting the national determined contributions (NDCs) and works at both national and regional levels. During the COP23, the PIPA team hosted a side event in cooperation with Asian partners from a eco village development project. 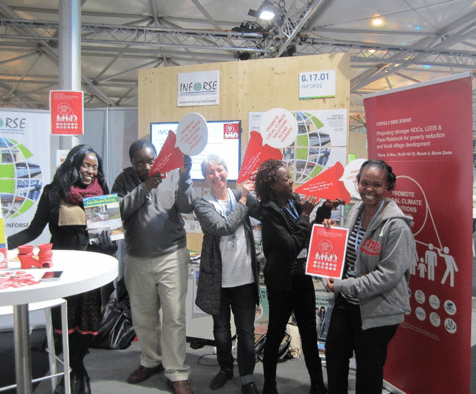 The side event had the slogan promote local climate solutions to end poverty. The key messages of the side event were that there is an urgent need for stronger NDCs that include low emission solutions to increase energy access and improve livelihoods to reduce poverty. Already at this stage of the project, there are indications of tangible results from all 3 countries. This is especially seen in relation to an increase in inclusion of civil society in the political processes of the NDC adjustments and Paris Agreement implementation. An example is TaTEDO which now has been recognised as a key player when it comes to climate change by the Vice Presidents Office – Department of Environment. In addition, NGOs are increasingly invited as resource persons in climate change related issues. TaTEDO for instance, has been invited to participate in a team of experts to review the ongoing NDC assessment. In Kenya, the relations with the Climate Change Directorate has improved. This is evidenced by a significant increase in invitations for SusWatch-Kenya and its members for government meetings including climate finance, revision of national plans and pre-COP23 planning meetings. From March to May 2018, an external evaluation is planned to assess the impacts of the PIPA project. The main emphasis of the evaluation will be on evaluating the approach of national and regional cooperations on joint advocacy applied in the PIPA project.